I have been paying increasing attention to the "Keep Calm" meme, which seems to be almost everywhere, these days. The original "Keep Calm" slogan, according to Wikipedia, "was a motivational poster produced by the British government in 1939 in preparation for the Second World War." "Keep Calm and Carry On" was the government's original message. That does sound very "British," echoing the "keep a stiff upper lip" approach to adversity that is identified with the British people. Wikipedia tells us that "the [original] poster was intended to raise the morale of the British public, threatened with widely predicted mass air attacks on major cities. Although 2.45 million copies were printed, and although the Blitz did in fact take place, the poster was hardly ever publicly displayed and was little known until a copy was rediscovered in 2000 at Barter Books, a bookshop in Alnwick." Since that rediscovery, the "Keep Calm and ..." motto has been used to sell products and to provide various kinds of motivational advice. 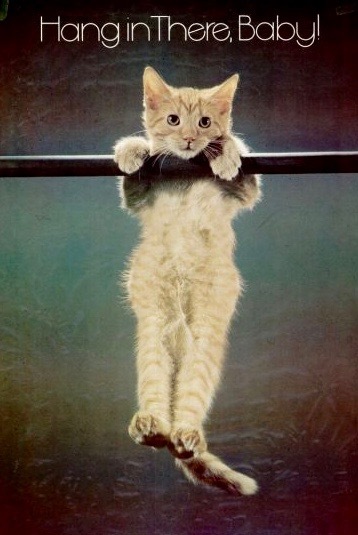 It is, apparently, the most recent version of the "Hang In There" advisory, which many may remember. Who could forget that feline philosopher? As you can see from the picture heading up today's blog posting, one popular piece of "Keep Calm" advice is to "run out the clock." This is definitely a "Hang In There, Baby" idea. If you can just "hang in there" long enough, in other words, you will probably survive (and maybe even prevail)! 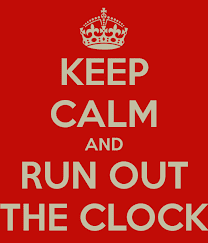 One of our presidential candidates is, at the moment, apparently following a "Keep Calm and Run Out The Clock" strategy, and certain pundits think that this strategy will work. Others don't think so, or at least think it's risky. That includes a number of Democratic members of Congress. The premise of a "run out the clock" strategy, in football, basketball, or politics, is that the other side won't have the juice to overtake you, if you are ahead, and if there isn't much time left, and if you don't do anything stupid. Maybe that concept is going to work for Hillary Clinton, but I agree with the pundits who think it's a risky strategy. My idea about political campaigns is that campaigns are an opportunity for each voter to make a choice about possible futures, and to select the candidate who seems most committed to working for a future that the voter finds appealing. The voter's focus, in other words, is almost always on what the candidate is going to do for the voter. Right now, I think most voters want fundamental (I'd even say "radical") changes in the way that this country is being run. Donald Trump is definitely saying that he is going to "make changes." A "run out the clock" strategy can easily be interpreted as a statement that nothing further is required, in terms of political change. Just "elect me" (the other guy's so horrible), and everything will be fine. I think this is a very risky basis upon which to ask for a vote. At least, it doesn't appeal much to me!